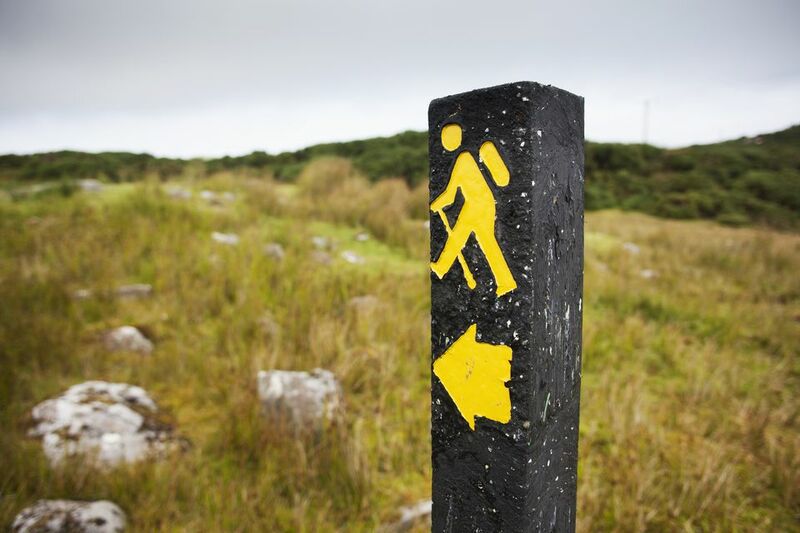 Hiking through Ireland can be a rewarding alternative for anyone moderately fit and with a willingness to invest their own muscle-power into getting from A to B. Several way-marked routes are available for long-distance hikes and shorter routes are identified locally. Plus an abundance of publications is available, describing shorter or longer walks. Preparation is the key to a good walk - in theory (planning and reading up on routes) as well as in practice. Buses and trains can take you to the best walking spots, a good idea if you want to skip some miles in-between as well. They, however, take time - a rental car might be far more convenient if you are planning day tours mainly. Several companies offer walking tours, including pre-booked accommodation, planned routes, luggage transfers and a back-up vehicle. While this generally is akin to a package tour, it will considerably ease your planning. Most guides are also very knowledgeable and there really is safety in numbers if you are walking to remote spots. This should be a no-brainer, but every year Ireland's mountain rescue teams have to deal with injured hikers in light trainers or even loafers! Ireland's weather has a deserved reputation for variety and hikers will have to pack for this. Also consider safety - wearing a hi-viz vest when walking stretches on roads (see below) is recommended. In Summer days are long in Ireland, but once it gets dark the darkness is total. Bring a decent torch! Unfortunately, many long-distance walks have to use quite busy roads at times and for considerable distances. On these you are the weakest link - make sure there will be no sudden good-bye! Stay as close as possible to the left side of the road at all times, resist the temptation to walk in clusters and always be prepared for cars or trucks. On most country roads you will hear those long before you can see them - using a Walkman or iPod while hiking is not a good idea. You will be offered the occasional lift or may go hitch-hiking yourself - generally, this is fairly safe, but the usual precautions apply. Unless you want to tour Ireland the Celtic way (in mysterious spirals, that is) a good, detailed map is a must. The maps provided by OSi are the best choice, but brush up on your map-reading skills and bring a compass. Ireland's highways and byways are generally running between hedges of considerable height and density. Once you are leaving farm or ranch country there are fewer hedges, but the marked way may get boggy, soggy or just uneven. Trespassing can lead to serious problems and a sign "Private" should make you re-route. There is virtually no rabies in Ireland, so most dangers from wildlife arise when you trespass on their comfort zone - vixens protecting their young are not known to be very tolerant. Livestock in its most dangerous form is the bull, each year several serious injuries or even deaths through goring or trampling occur! Irish mountains are not of Himalayan (or even Alpine) proportions and seem to be an easy walk. This is true in most cases, but sudden weather changes can lead to treacherous and dangerous conditions. Even in the Dublin and Wicklow Mountains hikers lost in thick cloud cover are a regular occurrence. And though terrain may seem soft off the way-marked trails, sudden drops hidden by undergrowth are not unknown. Especially if hiking cross-country take a decent kit, maybe including a cellphone (though reception may be patchy). And tell somebody where you are hiking and when to expect you back.